A 19-year-old Elgin youth was recovering from injuries at a Lincoln hospital early this week after the car he was driving struck the rear of a Boone Central school bus last Friday afternoon, Feb. 24. The accident occurred at 3:49 p.m. Friday on Highway 14 six miles northwest of Albion, according to the Boone County Sheriff’s Department. The school bus had stopped in the northbound lane of the highway, with lights flashing and stop arm extended, to let off students. The bus was struck in the rear by a 2007 Ford Fusion driven by Corey Schindler of Elgin, who was alone in the vehicle. The sheriff’s office said Schindler had apparently been distracted and taken his eyes off the roadway. 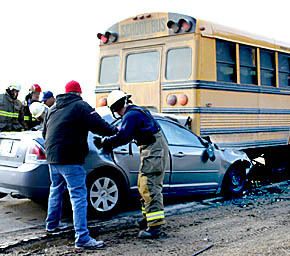 After the collision, the front portion of the car was lodged under the bus. Firemen used the Jaws of Life and lifted the top from the car to extract Schindler, who was taken by ambulance to Boone County Health Center and transferred by LifeFlight helicopter to BryanLGH West in Lincoln. Schindler was listed in fair condition Monday at Bryan LGH West. Details in the Feb. 29 Albion News & Petersburg Press Print and Electronic Editions.